Woman in Gold (2015) is a David and Goliath story that would make Malcolm Gladwell proud. 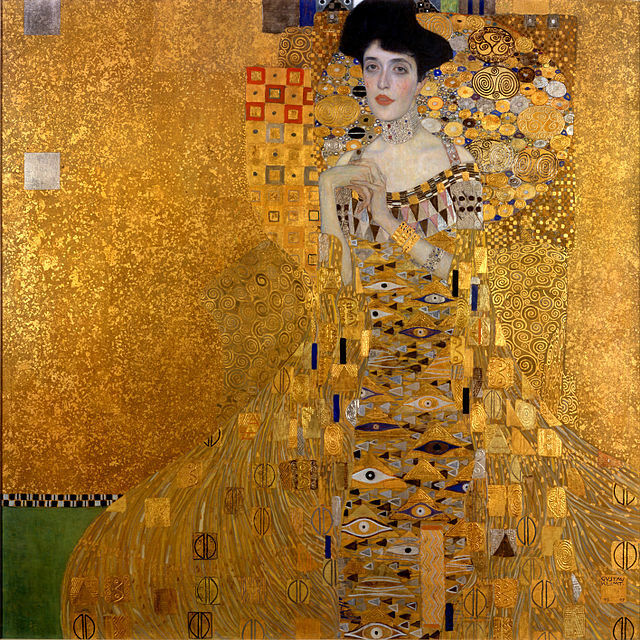 The film y is based on true events surrounding Maria Altmann’s attempt to reclaim five paintings by Gustav Klimt that had belonged to her family prior to the Nazi Anschluss of Austria. Her Jewish family had been a gathering place for many famous artists including Gustav Mahler, Richard Strauss, Johannes Brahms, AND Gustav Klimt. Her uncle Ferdinand Bloch-Bauer, whose wife Adele was one of Klimt’s favorite models, bought the portraits of his wife from the artist, and they hung in the home that Maria grew up in. Shortly after her marriage, she and her husband barely made a harrowing escape from Austria before the Nazis closed the borders and eventually found their way to California. When in 1998, Austria passed new laws to make restitution of Nazi-stolen art more accessible, Maria began a process of trying to get back the Klimts that belonged to her family—and that is where the film begins. As always, Helen Mirren is remarkable as the older Maria Altmann. Her foreign accent and German pronunciation are absolutely convincing. Ryan Reynolds is a little pale beside her, but is adequate to the part of her attorney. The foreign cast members are terrific, especially Allan Corduner who plays Maria’s father. The agenda of the film is the same as the George Clooney The Monument Men (2014), but this is more about the personal impact of the Nazi pillaging as well as the struggle for closure for the victims and their families. One of the most poignant scenes finds Maria weeping after her victory because it did not bring back the people or times that had been stolen from her. If you care about such things, and you do—but you may not realize it—the production values of the film are also outstanding: the golden tones play with the “Woman of Gold” theme, the widely varied soundtrack (from Schoenberg to O Mary Don’t You Weep), and the lush sets from fin de siècle Vienna all capture your senses. Although the film has a happy end, the limits of restitution, both for the victim as well as those who create barriers are carefully explored, so, while it is not a complicated film, the drama feels authentic. You will enjoy this film, and you’ll want to go see the Klimts in person the first chance you get. Those are worthy results from two hours in the cinema.